Posted on January 27, 2016 by F.H. As many teachers around Australia are gearing up for another year in the classroom, I am sitting on the couch watching tennis, reading books and painting my toenails. This year is all about wellbeing for me. Yes, I am working 2 days a week in a variety of classrooms and will also put my hand up for relief teaching, but ultimately in 2016, I am putting myself first. In my Year 2 classroom in 2015 I began to think carefully about not only my own wellbeing, but the wellbeing of those in my care. Some of my students had diagnosed learning difficulties including Asperger’s and Oppositional Defiance Disorder, others came from broken families, some had infant siblings and the list goes on. With a few prompts from our Student Wellbeing Leader, I began to put this concern for my students into action, by creating a Social and Emotional Learning (SEL) Attendance Roll (using Smart Notebook software) that the students were in control of. Each morning, their names were clustered together under the ‘House’ icon, meaning they were at home. Once they walked in the door, they dragged their name to the appropriate column on the screen. Those students who were absent were still listed under the ‘House’, meaning they were at home. Some pages were about feelings – “How are you feeling today?” and featured a variety of visual images to students to work with, to assign their name to one of those feelings. I found that these pages often gave me a chance to do a quick one-on-one chat with a child while they were unpacking their bag, or simply keep an eye on them for any signs of emotional distress throughout the day. I also created pages for graphing what each student ate for breakfast – we found that cereal was always the most popular – and check-ins for the end of playtime, end of the day, or to see how many stars you would give the weekend you just had? This Smart Notebook document is available from my TPT store, which you can find here. I’d love to hear any other feedback about how you cater for Social and Emotional Learning in your classrooms – mindfulness is a huge buzz word at the moment, but it’s no good if we don’t put it into action! Posted on July 6, 2015 by F.H. This year our school has adopted the 5 C’s for our core values and overarching motto. They underpin our relationships with students, the Chapels and devotions we have and our behaviour management. At our fortnightly assemblies, we recognise a student from each year level who has demonstrated the particular ‘C’ of the fortnight. Even though I introduced these with my class early on in the year and refer to them throughout the week when praising certain behaviour, I felt that I wasn’t utilising the 5 C’s to their full potential. 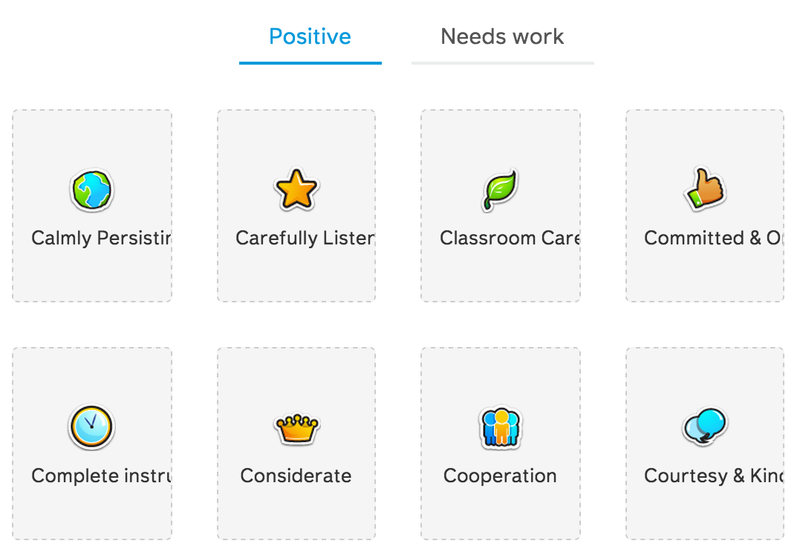 I recently began using ClassDojo and the little lightbulb in my head lit up last week when I came up with a way to integrate the two aspects. As a fan of alliteration and catchy titles, I’m hoping that these 8 C’s will tie in with the 5 that we already recognise as a whole school, meaning that students will be completely immersed in the language and the expected actions. Posted on June 28, 2015 by F.H. On Wednesday I arrived home at 5:30 and crashed on the couch in tears. I honestly felt like my students had broken me. Over the last four years of teaching, I have prided myself on having fairly ‘good’ behaviour management. I’ve had behaviour management ‘systems’, visual strategies and classroom expectations. All have worked well. I have lots of external classroom support, but it means so many of my students are in and out of the room at different times, in different rooms, with different teachers and aides…that it means I have to be planned and organised to the utmost degree…and God forbid that one of them is away, because I’m turning into that pedantic teacher that cannot handle any change to the timetable because it means that a) the students cannot handle it and b) their teacher is about to explode. I spend my days given instructions at least 8 times over. I also use visual cues and hand signals to give directions to save my voice – however they only work when the student actually cares to look. By the time all of them have worked out the directions, we’ve lost 20 minutes of learning time. Use a timer you say? Yes, there’s a massive countdown timer on my interactive TV…but there are some students who are oblivious to any sort of timeframe. I skipped my yoga class on Thursday afternoon and went home in tears again. My job overwhelmed me. The insane combination of behaviours and learning disabilities had made my head spin. I feel like I am failing the children who are actually wanting to learn.